CT Governor Danell Malloy signs updated stronger bullying legislation which now includes cyber-bullying. 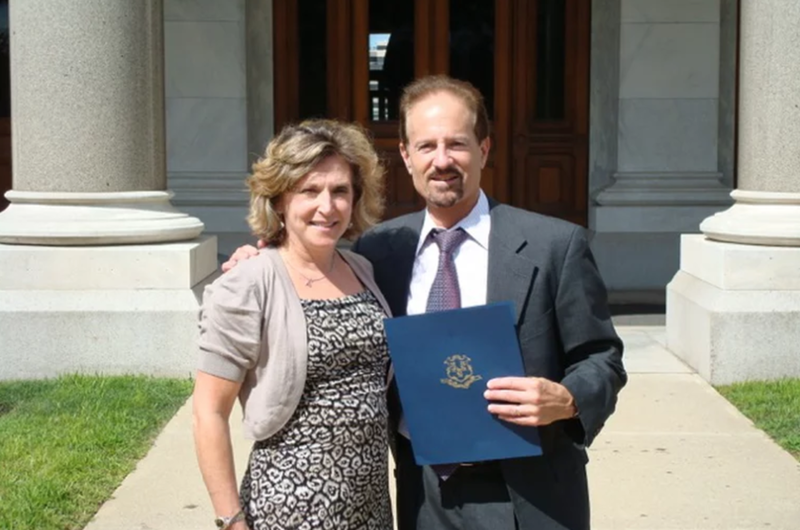 Debbie & Alan Berman invited to attend and the governor gave them a copy of the bill. Husband & I worked with CT legislators responsible for crafting stronger bully bill legislation whichwould include cyber-bullying. Testified before Education Committee on behalf of Bill S.B. 1138, An Act Concerning the Strengthening of School Bullying Laws. 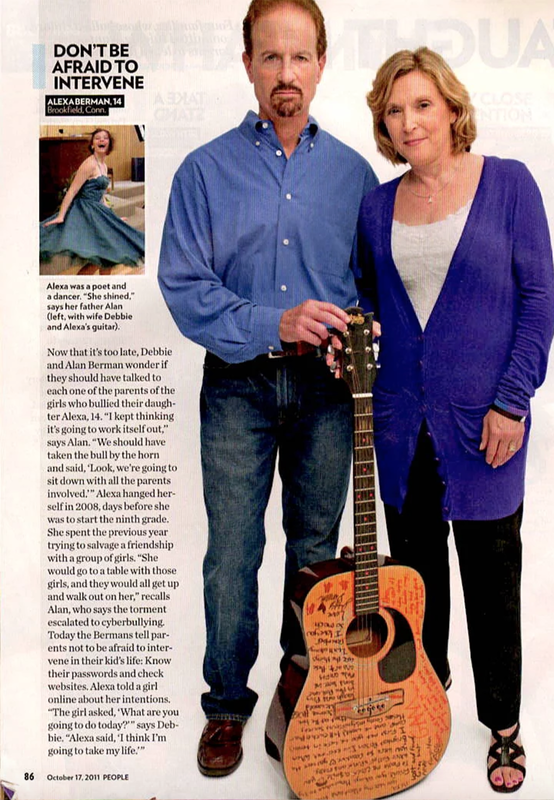 Interviewed with husband for a 10/17/11 People Magazine article entitled, "What My Child Taught Me," highlighting lessons learned by parents of 4 children who died by suicide due to bullying. Interviewed for several articles in The LEGAL, a NJ newspaper about the law for young people, in a Special Anti-Bullying Edition. Wrote various other articles and Letters to the Editor in local area newspapers to raise awareness about bullying. My name is Debra Berman. I am the mother of a child who experienced intolerable bullying in middle school and I am also a literacy support teacher in an elementary school. I submit testimony in support of Bill S.B. 1138, An Act Concerning the Strengthing of School Bullying Laws. I would first like to tell you a little bit about my daughter, Alexa. She was a lovely girl-not just physically. That was the least of it. She was artistic, insightful, witty, and humble. She was a dancer, a poet, an artist, and a real humanitarian. She was the light of our family’s life. That light was extinguished on August 23, 2008, when she was just 14 years old. It was her dad’s birthday and just 3 days before she was to begin high school, which was significant, because she did not want to go. Alexa took her life that day. She hung herself in her bedroom. Although numerous factors likely led to this tragic outcome, the most prominent one was the cruelty heaped upon her by girls who had formerly been Alexa’s friends. For her entire 8th grade year she was shunned, demeaned, and made to feel worthless, both in school, and at home via the computer – mainly through I-M’s and photos - photos showing activities the girls engaged in, but excluded Alexa from. This updated bullying legislation is critical if Connecticut hopes to prevent tragedies like Alexa’s from occurring in the future. I deem Alexa’s suicide a ‘quiet’ one. She did not jump off a bridge. There wasn’t a large gang of bullies that were visibly tormenting her. Had teachers and other staff been more aware of what to look for, they might have picked up on the signs where it was evident. Alexa’s suicide did not receive a lot of press and there were no famous people stepping up to rail against such a tragedy, but her death was just as tragic as all the others and left her family just as devastated. It is these ‘quieter’ suicides which are the ones that are most prevalent in our communities. It is up to our schools to take the appropriate actions to try and stop them. This legislation attempts to do just that. It is of the utmost importance that the cyberbullying clause be added to the bill. It is on the computer and other electronic devices that our youth feel empowered. When two of the girls cyberbullied Alexa they ‘trapped’ her by pretending to be one another. Alexa did not know who she was responding to when she was sent a message and she was often attacked for her responses. ill S.B. 1138 addresses education for all staff in the schools and recommends a safe school environment coordinator. This is essential. I say this as both an educator and a parent. It is important to note that the training in bullying prevention is just the first step. It will take a concerted effort on every single staff members’ part to truly change a school’s climate. The implementation of the bullying policies must become part of the everyday culture of the school. In Sec. 10-222g. #4 the bill states that schools will establish appropriate consequences for those who engage in acts of bullying. These consequences, once developed, must be publicized to all students and their parents. It is imperative that they be strictly adhered to once established. The victim should be informed of the outcome once the bullying event is reported. On point #5 which calls for adequate adult supervision of common areas where bullying typically occurs, it is vital that this adult supervision include certified teaching staff, not just paraprofessionals, as is the norm. Quite often, teachers are not aware of students who are bullied, or the perpetrators, because they do not see the students in these unstructured settings. Every single one of Alexa’s teachers would tell you they were shocked that she took her life because she presented herself in class as a self-assured, outgoing young lady. If they went into the cafeteria they would have seen a much different girl. Lastly, the legislation needs to include the responsibility of bystanders. Students are afraid to speak up when they witness bullying for fear of retaliation. The training must address the fact that studies have shown incidents of bullying decrease if reported. A correct response just might save a schoolmate’s life. If Bill S.B. 1138 passes it will bring some measure of peace to our family because we will know that Alexa did not die in vain. Thank you for the opportunity to comment on such an important issue. Debbie Berman is a mother, a survivor of suicide loss, an educator.